A gang offers £1,000 a week to Royal Mail staff to steal bank cards, a BBC investigation finds. After a dull and damp start with cloudy skies and some light rain and drizzle the afternoon will be drier and brighter across the BBC East region. It will become warmer as sunny spells develop across the west of the region. A new week of live updates for Bedfordshire, Hertfordshire and Buckinghamshire starts here as autumn approaches and gardens are still full of life and colour. We'll be here until 18:00 keeping you up-to-date with the latest news, sport, weather and travel as it happens. We'd love to know what's going on in your area and you can get in touch easily by the "Get involved" button at the top of the page. It's Sara Thornton next with the weather. M25 Hertfordshire anti-clockwise severe disruption, between J24 for A111 and J23 for A1. M25 Hertfordshire - Very slow traffic on M25 anticlockwise between J24, A111 (Potters Bar) and J23 A1(M), because of an earlier overturned car. Travel time is 60 minutes. All lanes have been re-opened. 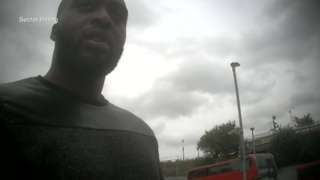 Congestion to J26, A121 (Waltham Abbey). M1 Bedfordshire southbound severe disruption, between J12 for A5120 and J11 for A505 Dunstable Road. M1 Bedfordshire - One lane closed on M1 southbound between J12, A5120 (Flitwick) and J11, A505 (Dunstable South), because of a broken down vehicle. A507 Bedfordshire both ways severe accident, between Shefford Road and A600 Hitchin Road. A507 Bedfordshire - A507 in Shefford closed in both directions between the Shefford Road junction and the A600 Hitchin Road junction, because of an accident. 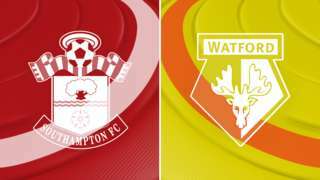 Follow live text, images, and analysis as Southampton face Watford in the Premier League. M1 Bedfordshire southbound severe disruption, between J11 for A505 Dunstable Road and J10 for A1081 Airport Way. M1 Bedfordshire - One lane closed on M1 southbound between J11, A505 (Dunstable South) and J10, A1081 (Luton Airport Spur Road), because of a broken down vehicle. Traffic is coping well. 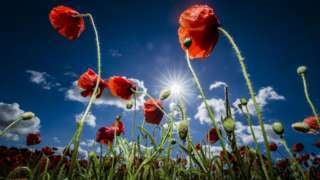 A carpet of crimson is planned across the UK to mark the centenary of the end of World War One. "Hideous" bollards shaped like children are installed outside schools to deter speeding motorists. Academy graduate Callum Brittain's first senior goal sees MK Dons salvage a 1-1 draw against Oxford United at Stadium mk. Wycombe make the most of a first-half horror-show from Forest Green Rovers to claim their first home win of the season. Lincoln's game with Luton finishes as a stalemate despite some entertaining football being played in their League Two draw. Joe Martin scores a fine fine free-kick late on to earn Stevenage a win at Cheltenham in League Two. 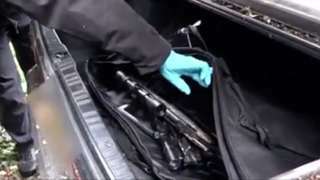 Police seize car parts which they suspect were stolen from across England by forced workers. Video caption: About 100 officers raided addresses in Maidenhead, Farnham Royal and Kidderminster.About 100 officers raided addresses in Maidenhead, Farnham Royal and Kidderminster. A League Two football club has one of the best walking football teams in the country. A1(M) Hertfordshire southbound severe accident, between J7 for A602 and J6 for A1000. A1(M) Hertfordshire - A1(M) blocked and stationary traffic southbound between J7, A602 (Stevenage) and J6, A1000 (Welwyn), because of an accident. Congestion to J8, A602 (Stevenage). A1(M) Hertfordshire northbound severe accident, between J6 for A1000 and J7 for A602. A1(M) Hertfordshire - A1(M) closed northbound between J6, A1000 (Welwyn) and J7, A602 (Stevenage), because of accident investigation work. Traffic is coping well. 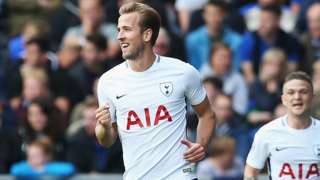 Listen to commentary on BBC Radio 5 live and watch Final Score, plus updates and analysis from the five Premier League games at 15:00 BST.